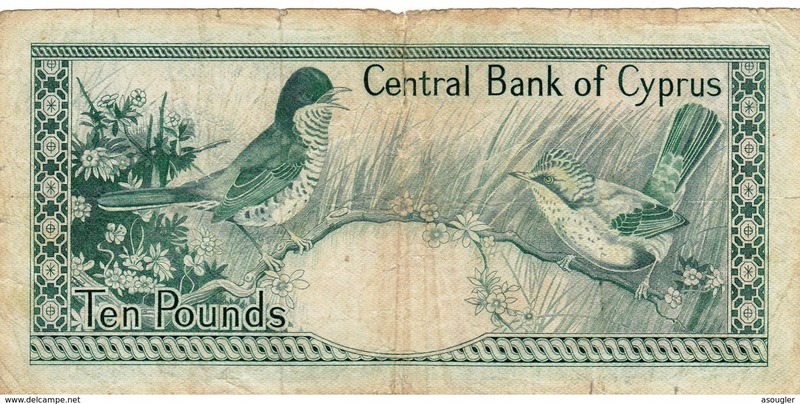 Chypre - CYPRUS (GREECE) 10 POUNDS 1-9-1983 (Pick 48b) Poor "free shipping via registered air mail"
ISSUED BY "ΚΕΝΤΡΙΚΗ ΤΡΑΠΕΖΑ ΤΗΣ ΚΥΠΡΟΥ / CENTRAL BANK OF CYPRUS / KIBRIS MERKEZ BANKASI"
with "Archaic bust at left, arms at right" on back:Two Cyprus warblers. In dark green and blue-black on multicolor nderprint. free shipping via registered air mail. FREE SHIPPING Payable by the seller!! the coins we selling are all authentic and the pictures are realistic about the product you are buying. We usually ship within 3-5 business days the products you purchased from the day of clearing your payments to our bank account. Our prices are tailored to suit and demand, as well as from commercial but also from our suppliers. If you have an inferiorly priced at our prices you can inform us with a message and we will look at your suit and one is good for us we will accept it. attention pls: Due to impose capital control applicable in Greece for an indefinite period on capital if you buy gold coins from us they will send them after 10 working days upon confirmation of your payment from PayPal to our bank account. Finally, any parcel that has not been requested by the customer and returned to the business as unclaimed may be re-sent to the customer. In this case, the customer must contact the business and explain why he has not received the parcel. If the justification is justified, the parcel with the order is re-sent. In this case, the customer will be charged again with shipping costs. you are responsible for any customs expenses incurred in your country in accordance with the customs laws of your country, this applies to countries outside the European Union.
! !please make your payments within 2 business days. if you do not, we have the right to cancel your purchase! !